Why is the moving image so suited to the expression of life? Life is movement, one might answer, and movement can most truthfully be captured in a format that allows movement. Life can be sequential or cyclical, but it is always animated. It is a series of different kinds of movements. If we are to take Shakespeare’s words for it, the act of living is “sequent toil” that involves “creeping like [a] snail”, “sighing like [a] furnace”, being “sudden and quick in quarrel”, “[strutting] and [fretting]”, and eventually “[shuffling] off this mortal coil”. Whatever the nature of our activities, we are and remain creatures of time, and the processes and phenomena of the universe we inhabit, too, remain rooted in temporality. The moving image, or images aspiring to movement, constitute a medium that we have utilised for centuries to acknowledge time’s complete hold over our lives. The earliest attempts at, or suggestions of, animated art can be found in prehistoric cave art – those magnificent, sweeping drawings and paintings of horses, bison, reindeer, ibex, etc. that have inspired lengthy and variegated ruminations by archaeologists, historians, and writers on the anonymous artists who produced them and reasons they could have done so. But central to all these hypotheses is a study of the terrific energy and movement evinced by the paintings. 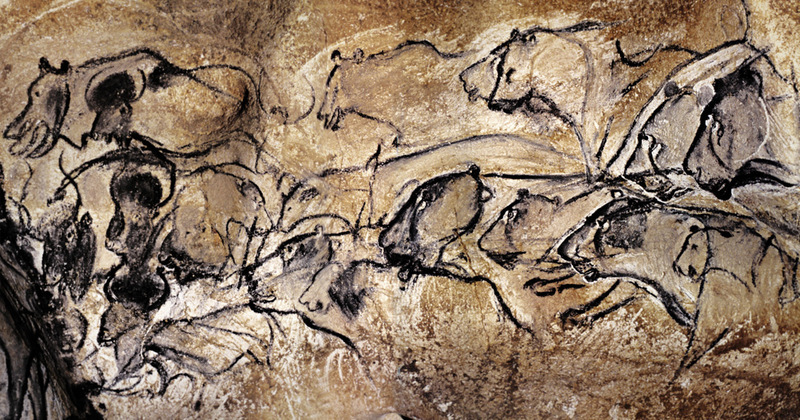 In the Panel of the Lions from the Chauvet Cave, for instance, speed, motion, and multitude are implied by sequential renderings of a lion’s head in profile – renderings that can be likened to animation frames. And while these drawings in and of themselves quiver with incipient animation, they also imply an animation beyond themselves – that of the passing of time – as many drawings “came, one after the other, sometimes to the same spot, with years or perhaps centuries between them, and the fingers of the drawing hand belonging to a different artist” (Berger, 5). Furthermore, it has recently been suggested by archaeologists such as Zach Zorich that many examples of cave art were meant to be viewed by the flickering light of lamps (lit by burning animal fat) and that this kind of lighting would have created the illusion of movement within the painted scenes. The proposition is supported by the fact that when the Lascaux caves were discovered in 1940, around a hundred small stone lamps were also found in its chambers. The lamps, Zorich proposes, may not have been used simply to illumine and guide people’s way in the gloom of the caves but also to light up the paintings in a contrived way, thereby reinforcing their sense of drama and movement (Zorich). Thousands of years separate the nameless Palaeolithic cave artists from contemporary practitioners of video and animated art, but one of their aspirations remains the same: to emulate or demonstrate or contemplate life. American video artist Bill Viola has discussed, at length, the pertinence of video to faithful depictions of life and the human condition. He sees “the ability to extend the self into time with the capacity to anticipate and to recall” as an entirely human faculty and one that can most effectively be encapsulated in video (Viola, 278). Viola’s own prolific output illustrates this. Works like Slowly Turning Narrative, Heaven and Earth, and Nantes Triptych (1992) all employ moving images to represent the effects of time on human life, or life’s inevitable succumbing to time and change. Slowly Turning Narrative runs a sequence of images of scenarios in which time plays a crucial and/or fateful role – a wedding, a car crash, a heart surgery, etc. Heaven and Earth and Nantes Triptych, meanwhile, juxtapose different slices as well as symbolic manifestations of time. In Heaven and Earth, a screen showing an old, dying woman is positioned directly over a screen showing a new-born baby, so that life and death are locked in a timeless embrace. In Nantes Triptych, three sequences – childbirth, a man floating weightlessly in water, and Viola’s mother on her deathbed – are played side by side to signify “the existential interconnection of birth, life, and death” (Neumaier, 67). The triptych also alludes to the “ability to anticipate” (the footage of the woman in labour shows the anticipation of life) and to “recall” (the sequence of the artist’s mother dying speaks of personal memory and of retrospection) that Viola has called an unequivocally human ability. But the moving image not only offers a means to address temporality, it also encourages a more physical and empirical engagement with itself – “physical” not in the sense of the tangibility of whatever is depicted but in terms of how, in experiencing video or animation, the workings of the human eyes and ears and mind are involved, making the reception of video art a complex and carnal and sensational process. In an interview with Raymond Bellour, Viola describes video art as having two halves – one being the technology that is harnessed in making a video and the other being “the human perception system” mobilised in receiving it (Bellour and Viola, 94). Viola, as someone who delved into video art when it was still a nascent genre and has been happily enmeshed in it ever since, considers video “a total living system” (Bellour and Viola, 94), which it is, because the moving image, better or more efficaciously than other media, recreates the peculiar ways in which image-sequences and fragments chase each other in our heads – entering, exiting, often re-entering, altered, and getting superimposed or replaced by newer fragments. This brings us to memory and its compatibility, too, with the medium of the moving image. The moving image is ductile: it can be sped up, slowed down, or played backwards to create a range of emotional effects. The workings and nature of memory can be evoked through acceleration, slow-motion, simultaneity, non-linearity, discordance – a staggering number of manipulative techniques. Memory governs our lives because, in the absence of a concretely existing future, the past remains seductive (Nabakov, 1). The past also continues to affect and disrupt the present while the future hovers just out of sight, immaterial and impassive. For artists who hail from places that are still reeling from the instability of their histories, the moving image takes on even more relevance. Its flexibility allows for the myriad ways in which collective loss and trauma influence the present to be depicted. William Kentridge, for instance, has famously used hand-drawn stop-motion animation to address the colonial legacies of South Africa. 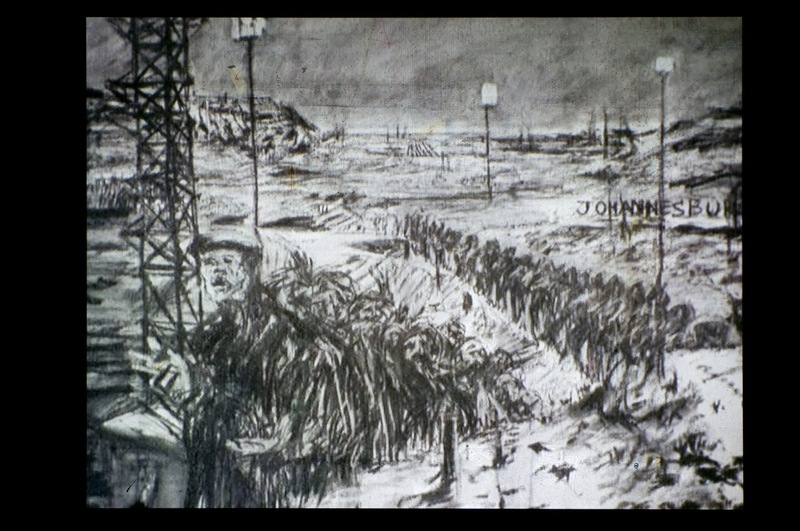 His Drawings for Projections (1989 – 2003), which deal with the apartheid, were the first of many animated films featuring his technique of filming the process of drawing, erasing, and redrawing to create movement. The act of inscription and subsequent erasure (never absolute, as traces of past drawings show through) comes to represent memory as palimpsest and the past as present, the present as past. Moreover, the innate viciousness of the process of erasing is at one with the devastation of a fractured or stolen history. Finally, a concern that usually trails the production, reception, and discourse surrounding video or animated art has to do with its comparison to the broadcasted, televised, or screened moving image. How is video art different from film, or something that can be viewed on TV? This is where space enters the discussion, because space plays a pivotal role in the display, dissemination, and experience of video art. By using space as an extension of video art, many artists find ways to control the viewer’s gaze and experience; they find ways to manipulate or influence the reading of their work. Away from and outside of a TV, computer, or cinema screen, a video work can be displayed in a such way as to create a defamiliarised experience. The installation of video art can incorporate props, sculptural interventions and accessories, and the use of inventive surfaces to add to the meaning and impact of the moving image itself. Technological advancement has, of course, been crucial to the increasingly radical ways in which video art is presented. The immersive splendour, for example, of Shahzia Sikander’s Parallax or the surrealistic weirdness of Tony Oursler’s projections on amorphous sculptures would have been impossible to achieve on and through a conventional screen. But though it may have been only recent scientific progress that opened up the disorientingly vast world of video art possibilities, the showman’s instinct in us, which prompts us to manufacture an entire experience, is definitely atavistic. Berger, John. Portraits: John Berger on Artists. Edited by Tom Overton, Verso, 2017. Zorich, Zach. “Early Humans Made Animated Art – Issue 11: Light.” Nautilus, 27 Mar. 2014, nautil.us/issue/11/light/early-humans-made-animated-art. Viola, Bill. “Putting the Whole Back Together. In Conversation with Otto Neumaier and Alexander Puhringe, 1992”. Reasons for Knocking at an Empty House: Writings 1973-1994. Edited by Robert Violette, Thames & Hudson, 2005. Neumaier, Otto. “Space, Time, Video, Viola”. The Art of Bill Viola. Edited by Chris Townsend, Thames and Hudson, 2004. Bellour, Raymond, and Bill Viola. “An Interview with Bill Viola.” October, vol. 34, 1985. JSTOR, www.jstor.org/stable/778491.